Hello everyone! 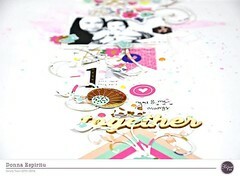 Enza here with a mini album to share with you today using the beautiful July Pool Party Travelers Notebook kit. The 4×6 cards from the Ain’t Life Grand collection included in the kit are just the right size. I started by cutting a few tag shapes from different patterned papers and adhered them back to back. I love how thick the papers are. There is no need to add extra cardstock in between the layers to make your pages stronger, which saves time and money 😉 Once all my pages were ready, I embellished them with a variety of elements. A mix of ephemera pieces, exclusive cut files and printables from the Clique store, and some stitching added that layered, unique look I love. The alpha stickers I used were included in the June Aquarelle kit. The copper color coordinates perfectly with the Pool Party TN kit. Some of the cut files were modified to fit the tag shape. Same idea was used for a couple of pictures, as well as the 3×4 cards that come in the kit. I just adhered them back to back, cut the top corners, and punched a hole to fit the other tags. I hope you enjoyed reading about my process and will maybe use your Traveler’s Notebook kit to make a fun and colorful mini album. Until next time. Have a lovely day! Categories: Locker Room, Uncategorized | Tags: Clique Kits Pool Party, cut files, Enza Gudor, July 2017, mini album, pretty little studio | Permalink. Melissa here with you today and I’m sharing a clean and simple card using the July Travelers Notebook kit. It truly is a perfect kit to make some cards! Just the right amount of papers and embellishments that are designed for the smaller scale of a Traveler’s Notebook… so, naturally, it would be perfect for cards too! To go with this post, I also have a process video I’d love to invite you to watch. Now, normally for these Art Studio posts, I’m always drawn to creating with paints and other “artsy” and messy supplies. Mixed media is always a go to. As I was contemplating what to do for this post, my “teacher hat” came on. I realized, YES… sharing our thoughts and ideas using all that product is awesome but, maybe we need to take it back to the basics and bit and talk about where we go for making sure our projects look pleasing to the eye (while still embracing our individual styles!). Artists have their founding with the Elements and Principles of Design. Elements are the components and Principles are we organize them… put them in to action, if you will. So, for a little review, here are the Elements of Design: Line, Color, Shape, Form, Value, Space and Texture. Principles of Design are: Balance, Emphasis, Movement, Proportion, Rhythm, Unity and Variety. Each of these terms are a little self explanatory but, if you’d like to go deeper with their definitions, you can check out this awesome resource at Oberlin. It’s a very clean and simple card. But, I thoughtfully used each kit item to create a well composed card. By using symmetrical balance, I utilized the colors and patterns of the papers to also create unity and variety. The flower is clearly the focal point. I also was able to draw attention to the lines and shape of the card design by bringing in rhythm and texture. Where does the emphasis lie? I believe on the flower but, your eye also is taken on a brief journey to the sentiment and cute little heart up top. You can find the July Pool Party TN Kit here. Use melissa10 as a discount code while you shop to save 10% on your order! Categories: Art Studio, Uncategorized | Tags: back to basics, Cardmaking, Cards with Melissa, Clique Kits Pool Party, Design, elements of art, flowers, fussy cut, glossy accents, handmade cards, inspiration, July 2017, Melissa Elsner, Pool Party, pretty little studio, principles of design, Travelers Notebook Kit | Permalink. Hello, Clique fans! Enza here today to share a new Traveler’s Notebook spread. Look at all the fabulous goodies in the July Pool Party Travelers Notebook kit! I went back to my good ol’ punches again. This is a floral border one from Martha Stewart that I have had in my stash for quite a while. The idea was to create a colorful background using different patterned paper from the Ain’t Life Grand collection featured in the kit. On the opposite side of the page, I used a mixed media paper from Kaisercraft that came in the May Sorbet kit. After cutting it to fit, I simply colored it with a mini ink blending tool and shades of ink that matched the colors in the papers. One of the sentiments from the collection served as my title, which was placed in the center of the page and backed with some thread for added texture. I layered the photo with a mix of patterned papers. The journaling, as well as some sentiments, were typed and then cut into strips. Categories: Field Notes, Uncategorized | Tags: Clique Kits Pool Party, Enza Gudor, July 2017, mixed media, Punches, Travelers Notebook | Permalink.